When manufacturing artificial radioactivity by neutron capture, it’s important to optimize both the irradiation conditions and the detection conditions according to the physics of the experiment—tailoring the neutron energy spectrum to the reaction cross-section with moderators, choosing irradiation and counting durations according to product lifetime, and using an appropriate detector for the expected activities (in these cases, all expected products are strong gamma emitters). My goal with the antimony is to detect Sb-122 from radiative capture of low-energy neutrons on the natural isotope Sb-121, i.e. Sb-121(n,g)Sb-122. With indium, I’m seeking the In-115(n,g)In-116m1/In-116m2 reactions, also favored by low-energy neutrons. The aluminum presents an opportunity to perform a fast neutron reaction, Al-27(n,p)Mg-27. I will discuss the challenges particular to this reaction in more detail later. I elected to use polyethylene as a moderator and reflector for all three irradiations. 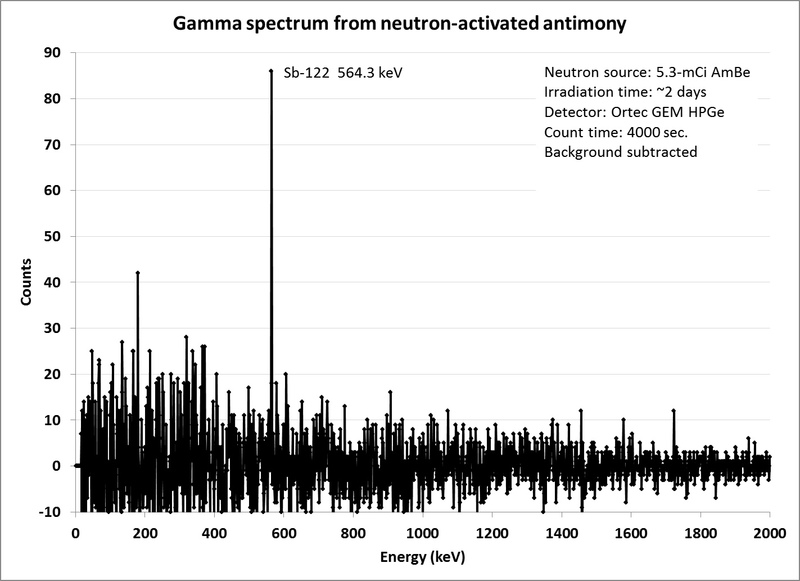 The AmBe source emits a broad spectrum of fast neutrons with a mean energy near 5 MeV, so the indium and antimony activations benefit from having those neutrons slowed down. The Al(n,p) reaction does not benefit from slow neutrons; however, the mean free path of fast neutrons in Al metal exceeds the thickness of my pieces, and the plastic will serve to reflect many neutrons back into the sample that would otherwise be wasted. Below are a couple ad-hoc contraptions to surround samples with plastic. 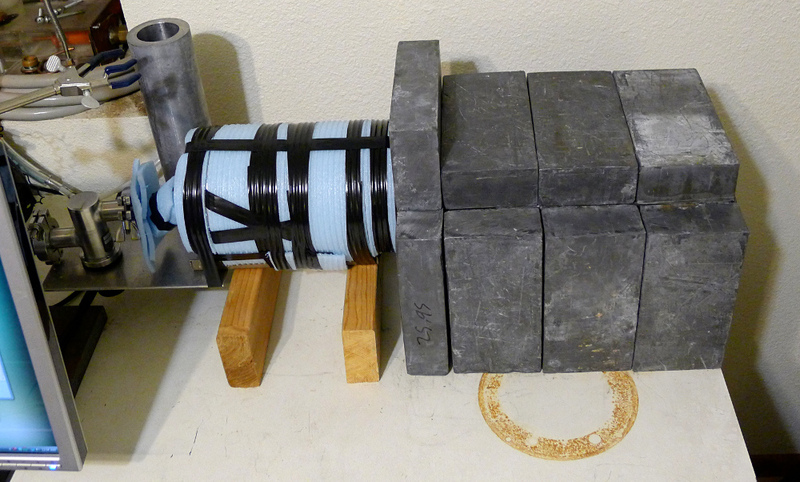 At left is my black HDPE “neutron oven,” originally part of a “Snoopy” neutron detector. At right is a more versatile concept—HDPE bricks. For no particular reason the antimony and aluminum went in the “neutron oven” and the indium was cooked inside the stack of bricks. The half life of Sb-122 is 2.72 days, so ideally the antimony would cook next to the neutron source for more than a week to bring it up toward saturation activity. I’m not that patient, so it cooked for only two days. In-116m1 (half-life 54m) saturates in a few hours, so I cooked the indium in contact with the neutron source for two hours. Mg-27 from the Al(n,p) reaction (half-life 9.5m) is expected at exceedingly low activity and a special technique of repetitive irradiating and counting was adopted: irradiate (1800 s), count (700 s), wait (700 s), count background (700 s), and repeat this sequence two more times. 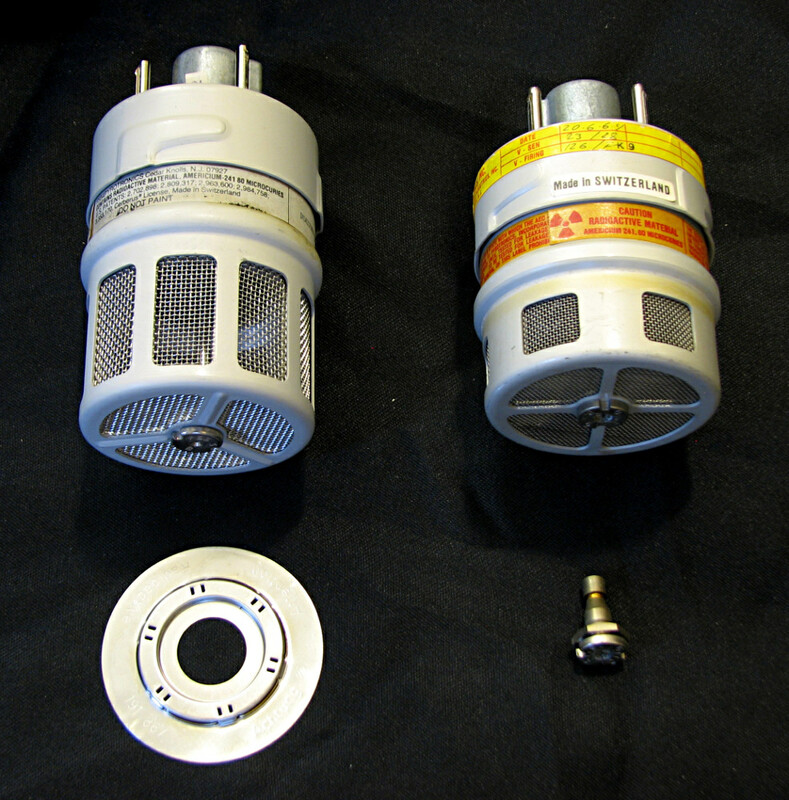 After irradiation, I counted the samples with the HPGe detector (left, its electronics at right). My approach is generally to count for at least one half-life if practical, but no longer than two. The count times (detector “live times”) are noted in each collected spectrum in the gallery below. Background spectra for subtraction are best obtained by allowing the sample to remain in position near the detector for several half-lives to decay, then counting again for as long as possible. I used this general approach with indium and aluminum, but with the 2.7-day antimony, it would have been somewhat impractical. An alternative is to simply remove the sample entirely and count as I ended up doing; a better alternative would have been to count the background before irradiation. The radiation from antimony has a simple spectrum that matches expectations of a 564.2-keV gamma ray accompanying 71% of decays. 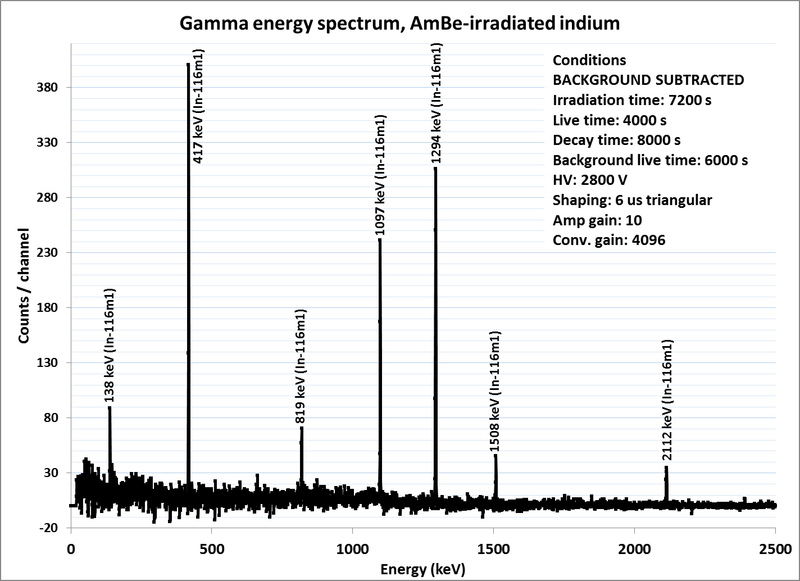 The indium spectrum offers a robust and distinct fingerprint of multiple gamma energies that are a textbook match to the expected values from In-116m1; other possible radiations from other isomers of In-116 or In-114 are not in evidence. And then we come to a genuine interpretive challenge with the aluminum. I expect a major peak at 843.8 keV (72%) and a minor peak at 1014.4 keV (28%) from Mg-27. Obviously there’s a peak in the immediate vicinity of the former value—its centroid is calculated to be 841.9 keV based on calibration of the energy scale with Cs-137 and Co-60. Close enough to be conclusive? Well, there’s a hitch. Manganese is an important contaminant in 6061 alloy. Its (n,g) reaction has a high cross section and results in 2.6-hour Mn-56, which emits an 846.8-keV gamma ray. There are just two channels of separation between 846.8 keV and 843.8 keV in my pulse height spectrum. Further infusing doubt into the Mg-27 hypothesis is the absence of a significant peak at 1014.4 keV, although only 12±4 counts are expected there—well into the noise. But if, on the other hand, Mn-56 is responsible for this peak, we can look to additional evidence to corroborate that hypothesis. 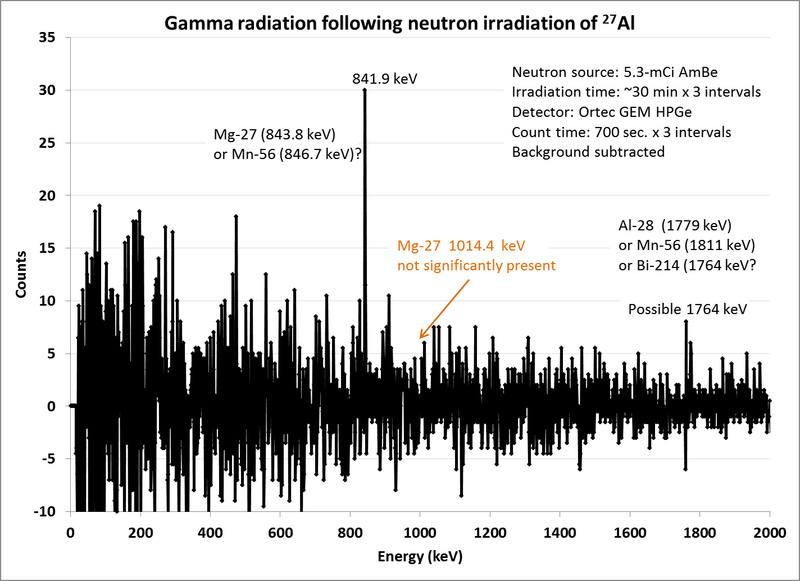 First, Mn-56 emits an 1811-keV gamma ray (27%) in addition to the 846.8-keV gamma ray (99%). There is the noisy suggestion of a peak at 1764 keV that could be Mn-56’s 1811-keV radiation if the detector’s energy calibration is poor, but this could also plausibly be Al-28 (1779 keV), or radon daughter Bi-214 (1764 keV). Second, Mn-56’s half life is much longer than Mg-27’s and longer than the duration of the experimental sequence, so the “background” spectra for this experiment should show many counts at this energy if Mn-56 is the culprit. In fact, the background has just 8 counts in this channel. In conclusion: I’m willing to put faith in my three-point linear energy calibration and attribute the 1764-keV peak to ambient Bi-214, and from examination of the background spectrum in this experiment, attribute the 841.9-keV peak to Mg-27. Sometimes these analyses aren’t straightforward! Here are my inaugural YouTube offerings treating neutron production, detection, and use for producing radioisotopes in the home laboratory. See an americium-beryllium neutron source (made from smoke detectors) in action! I hope to make more such videos in the future. 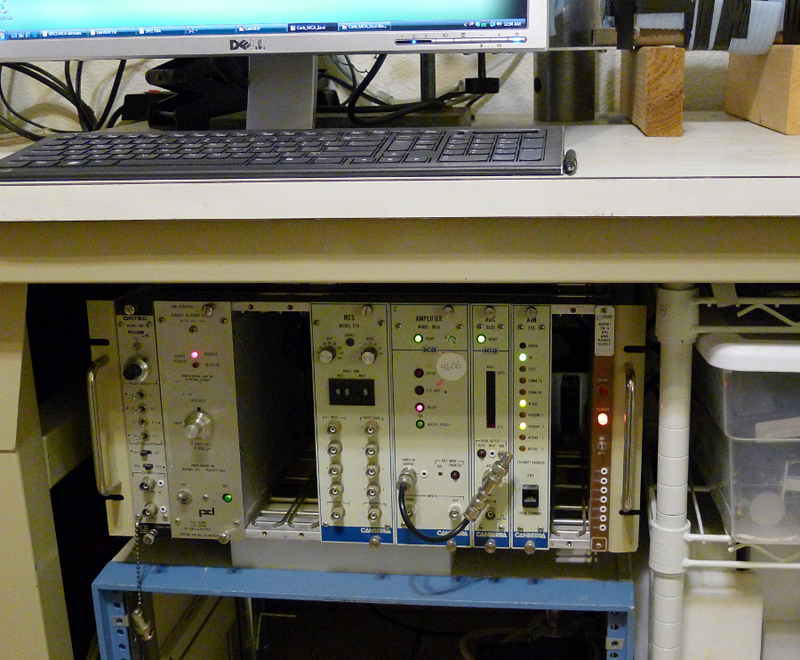 Here are a few photos of inorganic scintillators glowing from exposure to a ~ 300 R / hr x-ray field. These were all long digital exposures, 5-15 seconds, taken last year, and all had to be de-speckled extensively due to radiation noise on the camera CCD. Bismuth germanate (BGO) crystals from a PET scanner. 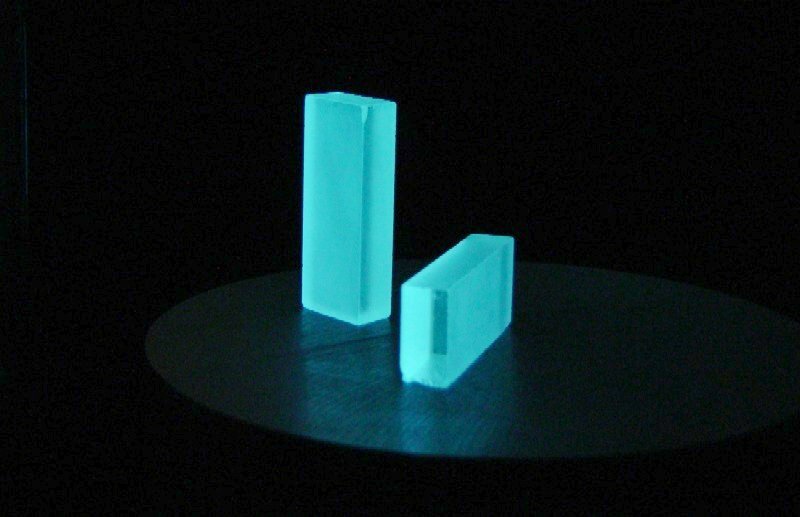 Lovely cyan glow, not particularly well-matched to photomultiplier tubes but gorgeous to the human eye. 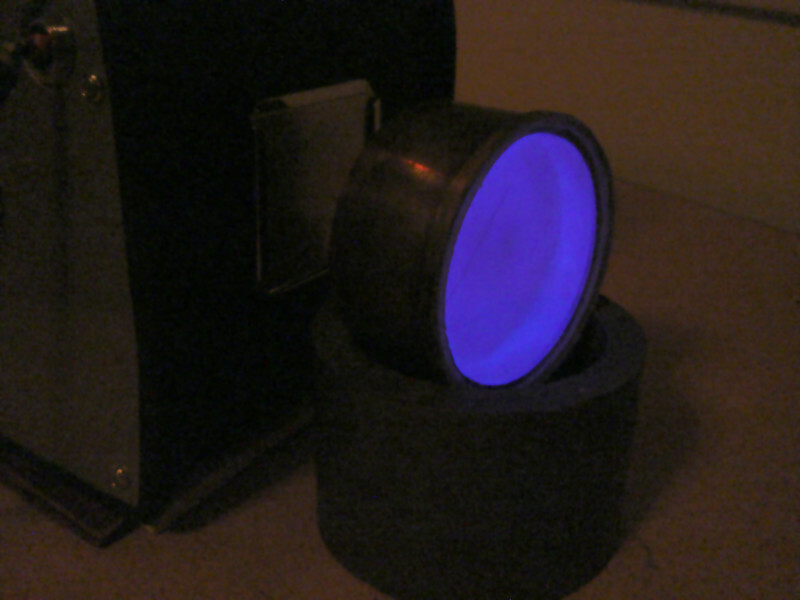 Dense, and a wicked photoabsorber of gamma rays, BGO is well-suited to portable homebrew scintillation detectors. Barium fluoride, a material of choice for fast pulse-mode gamma detectors. Much of the light emission is in the ultraviolet, and to the eye the glow appears a deep purple color. Perhaps there’s a use for this in fast neutron detectors based on inelastic scattering on F-19? Sodium iodide doped with thallium (NaI:Tl), the old standard for gamma spectrometry and high-class uranium prospecting. 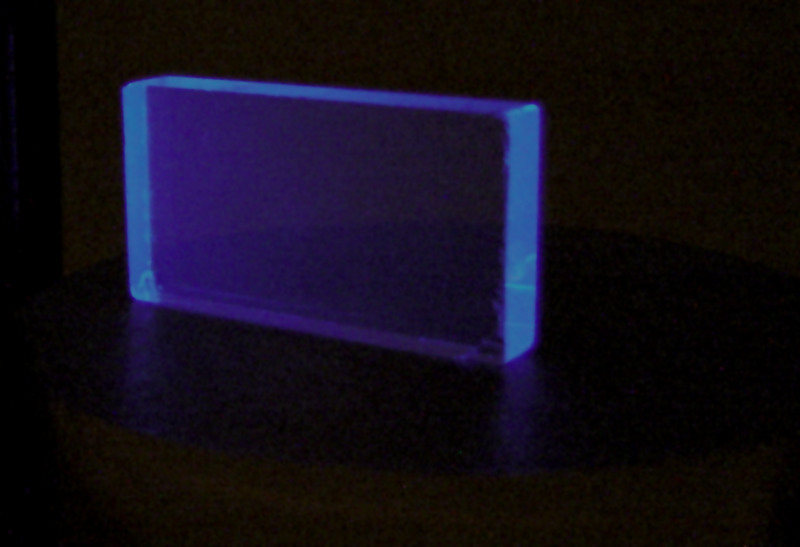 This 3″ x 1″ crystal is hermetically sealed because the NaI is hygroscopic. The rich blue glow resulting from exposure to a 60 microcurie radium source is literally bright enough to read by. Next to the x-ray machine, it shines like a spotlight!